Having tasted a few local cabernet francs over the past fortnight or so has rather led to a desire on my part to find out more about the history of the grape variety in Australia. 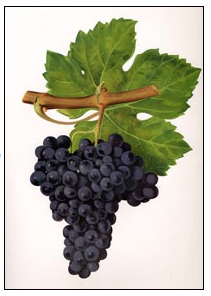 Part of this is because I’ve always wondered if there were local producers out there who are trying for a Saumur, Saumur-Champigny, Chinon, Bourgueil or Saint-Nicolas-de-Bourgueil style expression of the grape. That is, mostly fresh and fruit driven, with excessive greenness eschewed. And part of it, I suspect, is that I just like reading old books. “Cabernet franc is mostly found in Australia as odd vines in blocks of cabernet sauvignon“. But the story does not end here. Going further back in time, over at the Yalumba Nursery, we find that the C7V15 cabernet franc clone was imported/registered in 1970 via California from much earlier Montpellier cuttings and the 1334 Bordeaux cabernet franc clone was imported/registered in 1972. The so called “Penfolds 58” clone does not have this information, and is also called the C24-1. For reasons unknown, clones fascinate me. To hazard a guess though, perhaps it’s because their genetics provide tangible connections between the past and present. And then, just to round things out, on the State Library of South Australia’s Wine Literature of the World website we find that cabernet franc is said to have been introduced into Australia in James Busby’s 1832 collection! So, there are certainly some dots to connect here.